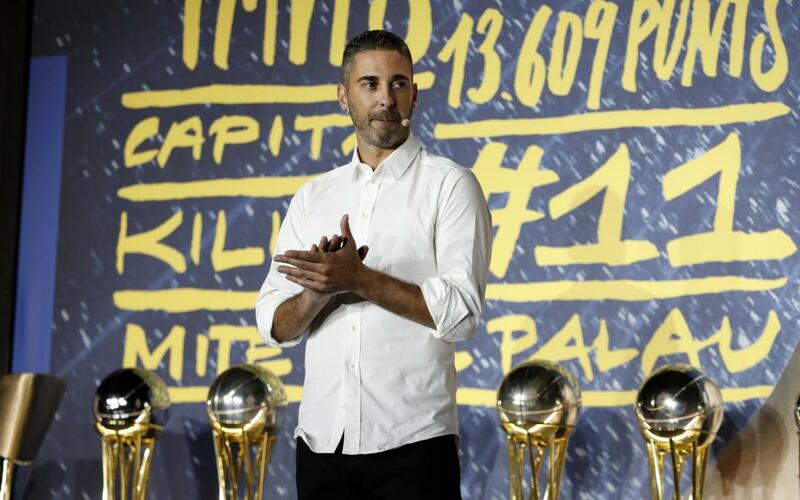 The Palau Blaugrana was dressed specially for the occasion with a spectacular stage on the parquet, Barça Lassa's home transformed to honour the legend, Juan Carlos Navarro. Personalities such as the President of FC Barcelona, ​​Josep Maria Bartomeu, Vice President Jordi Cardoner, Ronaldinho, Carles Puyol, Egurrola, Victor Tomás, Dyego and others all wanted to pay their own personal tribute to La Bomba. Those who arrived at the Palau in the last year, such as Seraphin and Pau Ribas were there, as were Grimau, Sada, Lakovic and Trias. Legends Epi, Solozábal and Roberto Dueñas couldn’t be kept away either. His friends played a fundamental role in the homage. Ronaldinho was even encouraged to defend a Navarro 'bomb,’ rising on a chair simulating a basketball defence. The Sant Feliu native took stock of his whole life at Barça, with the 35 titles achieved flanked by images of his career appearing on the screen. Carles Puyol, a Barça legend, wanted to share his admiration for 'La Bomba,’ remembering when the first team players went to the final against Olympiacos to support Barça Lassa. Roger Grimau, Victor Sada and Jordi Trias took the opportunity to explain what Navarro is like in the dressing room, with Xavi Pascual, coach in the Euroleague of 2010, present among the Palau's audience. Bartomeu: “We’re proud that you've been with us"
The president of the Club highlighted the "character and ambition" that Navarro had during his entire career, and handed the captain a very special gift: a photo with the titles he has achieved. Bartomeu also explained that Barça TV are making a documentary about La Bomba, which will be released shortly. Bartomeu explained that on the occasion of the next Barça Lassa - Real Madrid game, the Navarro No.11 will be placed on the roof of the Palau and hang there forever, in recognition of an exemplary role model.